NEM is a blockchain platform launched in 2015 that has a stated goal of a wide distribution model and has features such as a new proof-of-importance (POI) algorithm, multi-signature accounts, encrypted messaging, and a reputation system. XEM is the native cryptocurrency of the NEM blockchain platform. Let’s find out more about NEM and how its different blockchain deployments work. NEM’s main mission is to be a customizable blockchain platform for various use cases, including fintech systems, tracking logistics, ICOs, authentication etc. 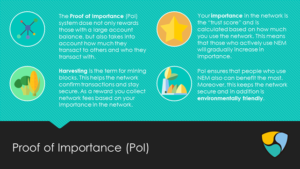 NEM’s consensus system, which is called “Proof of Importance (POI),” achieves consensus based on network theory, overcoming the energy and spending issues that come with Proof of Work and Proof of Stake. When a user sends a transaction on the NEM network, the transaction is added to the blockchain using a unique process called Harvesting. This is similar to Proof of Stake but utilizes techniques such as Vested Stake and Transaction Activity to dampen the “rich getting richer” effect of PoS. NEM’s primary vision is to be a cryptocurrency that is not just a currency, but an all-encompassing ecosystem that prioritizes security and advanced trustless computing and consensus mechanisms. NEM’s USP is focusing on developing an intuitive method of blockchain development for a developer. Tests have shown that NEM can handle 100 transactions per second, butCatapult upgrade will allow for more transactions, and a “push-pull” feature, which will allow a user to send in one coin, and the receiver to receive in another coin. The distribution of the supply was done to holders of the NEMStake asset on the NXT exchange, or to contributors of the Bitcointalk announcement. How do transactions work on the NEM blockchain platform? Harvesting in NEM is basically generating blocks, but instead of creating new coins, a block is created but no new coins are minted. Only the transaction fee can be earned by a harvester. Which node generates the block is decided by the POI or Proof-of-Importance algorithm, which primarily depends on three main factors. The prerequisite criteria to becoming a harvester are that a minimum vested balance of 10,000 XEM is to be maintained for a certain period of time. Harvesting is similar to Bitcoin mining, but does not use a Proof of Work to create new XEM coins, instead only the transaction fees can be earned. The POI system in NEM rewards users not only based on account balance but also factor in how much they transact with other users and what accounts they transact with. This means that those who actively help the economy and therefore NEM benefit, meaning the right people, are rewarded. Each user receives a reputation or a trust score that determines their chances of being rewarded. Vesting is a unique incentive to HODL coins, which rewards users that hold coins for a long time. It is one of the factors that affect the score of an account in the PoI algorithm. After 24 hours of the first deposit into an account, 10% of the account balance becomes “vested”. After another period of 24 hours, 10% of the remaining balance becomes vested. This action carries on for as long as the user maintains the balance uninterrupted in the account. POI rewards users who make transactions with others in the network. Larger and more frequent transactions have a greater impact on the POI score. Let’s take a look at few use cases of NEM. NEM’s Smart Asset System allows you to define and launch your own tokens or cryptocurrency with no programming needed.The Venezuelan government used NEM for the upcoming Petro project. Reward points are a huge use case for blockchain, and there are hundreds of reward programs of Hotels, Airlines, Banks and ECommerce sites that could be brought on the blockchain. Hitachi, a Japanese MNC has already pioneered the use of Mijin, which is a custom business version of NEM, for its PointInfinity rewards program.This program has over 1.5 million users. NEM provides voting security on par with the best financial grade security software. Votes can’t be tampered with since there’s a permanent and complete record of every entry and change. It’s appropriate for governments and institutions that require automation, speed, security, and transparency of voting records. NEM is the first blockchain with built-in multi-signature access. This makes it easy to control who has access to which data records or tokens and limit access to cryptocurrencies, tokens, and records tracked in the NEM blockchain. Support for Multisignature accounts means that the creator/owner of the account can specify how many users are required to authorize a particular transaction. By depending on three factors to assign importance to an account, NEM eliminates the drawbacks of a Proof of Stake system that just takes into account the account balance. This provides an incentive to use XEM as a currency and offsets XEM’s already low transaction fees. NEM essentially competes with other blockchains, so it faces competition from off chain scaling solutions like Raiden Network for Ethereum. Targeting businesses and partnerships will also have to be looked at in the coming months. Some concerns of competition would be big players like IBM etc, releasing their own third-party blockchain systems. The technology is sound and has not faced major security issues yet, apart from the Coincheck hack which was purportedly an inside job. NEM does not have a clearly defined roadmap on their website. Listed on Binance, HitBTC, UpBit, Zaif, Poloniex, etc. Launch of the Catapult upgrade.Phase 1 was launched on March 25th and is open to partners, customers,and select community developers. The team has not released concrete information regarding a 2018 roadmap. The NEM developers are pseudonymous but are still largely trusted by the NEM community. The key figures leading the NEM foundation have a public identity, while all of the developers do not reveal their real identities. NEM was started by a Bitcoin Talk forum user called UtopianFuture who was inspired by NXT. 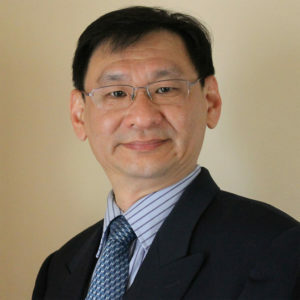 Long Wong, is the Founder and CEO of Dragonfly Fintech, a blockchain technology company and is the President of the NEM.io Foundation. Takao Asayama, the CEO of Tech Bureau is also part of the NEM Foundation. Jeff McDonald is the Vice President of the NEM.io foundation and was a core team member before the launch. NEM is a community project that has a unique and interesting consensus mechanism (Proof of Importance) that solves the issues of both Proof of Work and Proof of Stake mechanisms. The focus on building an easy and intuitive platform for developers is also a great endeavor, as this build the blockchain space as a whole. It remains to be seen if widespread adoption by projects will help the NEM blockchain, and whether the system will be able to handle the increased load in transactions. There will also be a lot riding on the marketing since NEM has difficult competition in NEO, Ethereum, and Cardano.